Growing one and a half to two feet tall, this plant finds its home on well-drained soil where it can receive sun roughly half the day, such as on the edge of woods and along roadsides. Just a few short weeks of glory is all the blooming time this lovely perennial receives, beginning March and ending in mid-June. The flowers are pink to purple, turning white towards the tube, with purple nectar guides on the lower petals, a good indication of pollination by insects. One stamen is sterile and is heavily bearded with yellow trichomes, or hairs. 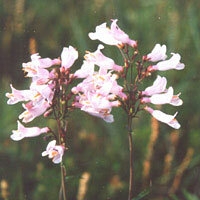 It projects from the center of the flower like a tongue, thus giving the plant its namesake.